These people were sharing their regrets. As I was hearing these comments, I thought of how sad it was for these people. But then I started thinking about what happens when we die and stand before Jesus. Are we going to be saying to Him the same kinds of things people said after Father Thomas died? 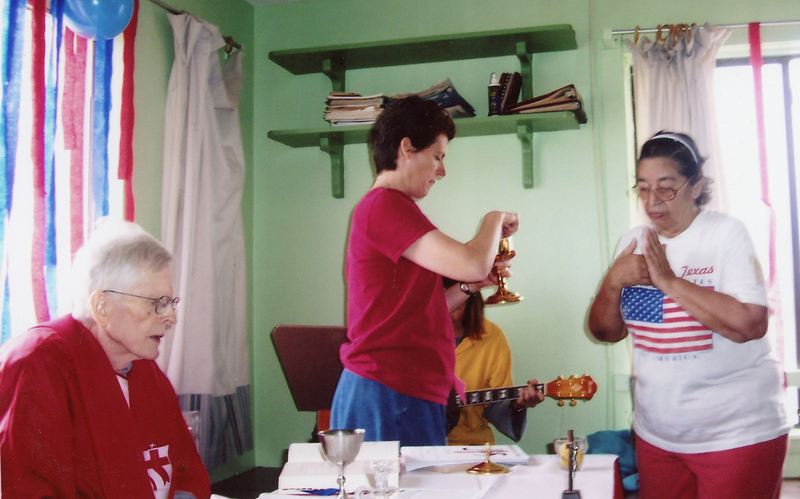 When Father Thomas was very sick, he still celebrated Mass up until two weeks before he died. He was unable to stand up so stayed sitting at the altar while one of us distributed Communion. This picture is from February 2006, about two months before he passed away. Living with regrets can be very painful. All of us have regrets. They often come to light when someone we love dies and are no longer with us. We realize that we will never have the chance to do or say what we wished we had while he or she was still alive. We only have this one life given to us. How are we using it? How are we spending our time, treasures and talents? When we die are we leaving behind unfinished business, things we wished we had done differently? Or will we be at peace and ready to face the Lord? How can we live in such a way so that we have fewer regrets? 1) Realize that our daily decisions and choices have consequences, here in this life and for eternity. That doesn’t leave anybody out. No one can say, “Well, I wasn’t very important in the world. What I did or didn’t do doesn’t matter. God might overlook me.” Nothing is hidden from God. 2) Learn what is pleasing to the Lord. This just makes good sense. Say for example you have a teacher in class, and you want to get a good grade. Well, you learn what the teacher is looking for and try to fulfill his or her requirements the best you can. God is the one we are going to have to go before when our lives are over. We want to know what He is looking for when we give our account of how we lived. So how do we do that? How do we know what pleases the Lord? Take seriously His instruction manual!! Read the Bible daily. Jesus said that He won’t condemn us — it will be His Word that condemns us. So if we want to know what is pleasing to the Lord we will read the Bible daily and try to obey it. Life is short! Eternity is eternal! We’ve only got this one life to live. Let’s give it our best shot so that we can stand before God without regrets.